On that day that I admitted three babies successively, there were two premature babies who immediately presented with respiratory distress (of course, it’s expected & understandable), and a full term. I thought that the full term baby was unremarkable until a few minutes after birth when he himself presented with respiratory distress. Initially, I thought it was because of fluid retention in his lungs that caused him to be breathing fast and appearing “bluish.” Fluid retention is usually a common disorder usually experienced by babies delivered via cesarean section (whose mothers did not undergo labor). To some extent, vaginally born babies may also experience transient tachypnea due for fluid retention especially if the labor was precipitous (shorted period than expected). Fluid retention usually resolves in six hours in most babies, but in few cases, may last up to 2-3 days. Babies presenting with such condition will not usually require antibiotic treatment, and will respond often to mere oxygen administration. I initially started the baby on oxygen inhalation. On the sixth hour of life, the baby remained with fast respiratory rate (tachypnea). We did an x-ray and did a blood test for a marker of infection. 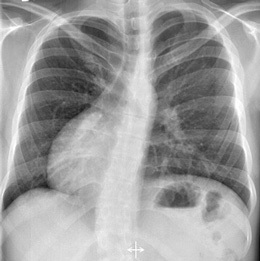 Chest x-ray was suggestive of pneumonia whereas the infection marker was non-reactive. Initially, I did not agree with the x-ray findings because the baby has no risk factor of having an infection so I did not start antibiotics yet. The baby’s respiratory rate actually normalized few hours afterwards, but his oxygen saturation was always low, especially when active and crying. This patient’s status and presentation is not compatible with the classical pneumonia cases. Nevertheless I was forced to start antibiotics (at the back of my mind, it’s better act than be sorry if in the end the baby has also a concomitant infection). On the third day, baby remained comfortable, with normal respiratory rate, however, still bluish especially when the nasal cannula delivering the oxygen gets accidentally dislodged from his nostrils. We also noted that the heart beat was stronger in the right side than in the left (which is the normal location of the heart’s tip or apex, and thus stronger heart beat is supposedly appreciated louder from that side). I was considering now that this might be a heart problem. I requested for a repeat chest x-ray to confirm my suspicion of a dextrocardia. 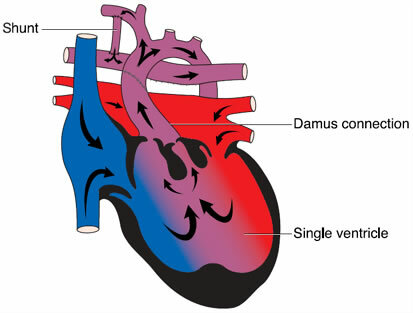 (Dextrocardia means that the heart apex is located in the right side, contrary to the normal). Few hours earlier, the baby was evaluated by a cardiologist. A 2D Echocardiography was done and revealed a dreadful finding, it sealed the baby’s fate. 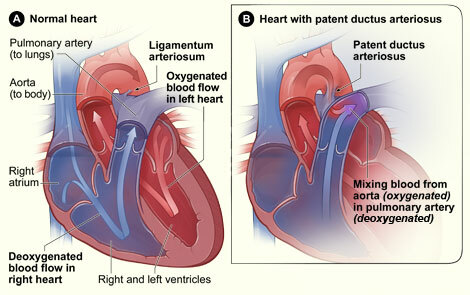 The baby indeed has a dextrocardia, but on top of that are more serious findings: situs ambiguous, single atrium, single ventricle, large patent ductus arteriosus, and moderate pulmonary hypertension. This just means, his heart is like that of a fish. I was literally dumbfounded when the cardiologist told me his findings. I dont know how the mother can take it when I will talk to her but I am glad that the burden of telling the mother went to the cardiologist. He would be in a better position than I explaining the baby’s condtion. This would be too heartbreaking on the side of the mother, especially so that she plans to leave for the Middle East after one month to work. Question now is, will she wait for the baby to die before she leaves? Few days after, yesterday to be exact, mother sent me an SMS that baby finally expired. May God bless his soul and take him to His kingdom.